The 4 x depth rule does not always apply. With deep water anchoring (stern-to in the Med), normal rules of anchor scope can sometimes fall by the wayside. The diagram below shows Just Imagine anchored in 3 m of water with 12 m of chain on the water, (the correct 4 x depth scope) resulting in a pull angle on the anchor of something less than 16 degrees(1). I am ignoring the catenary of the chain for this illustration. 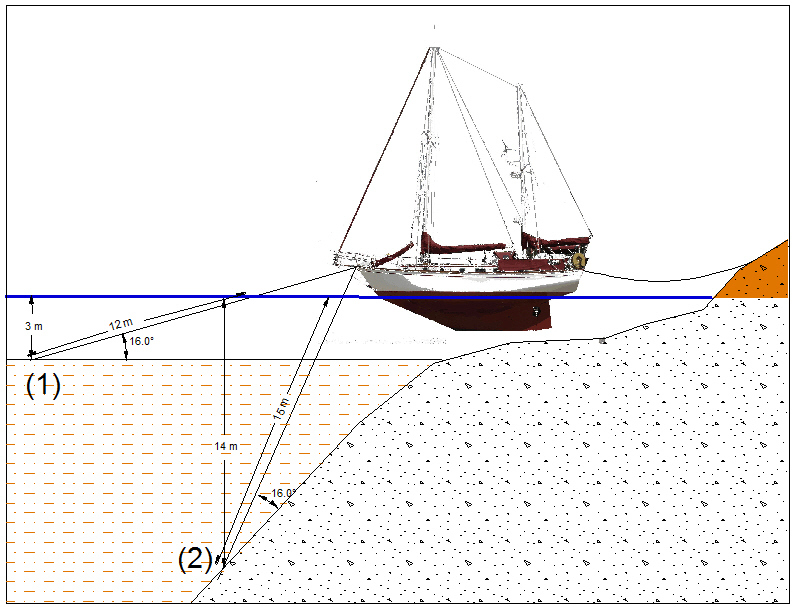 The same diagram shows the boat anchored in deep (14 m water) using the same 16 m length of chain, but, because of the slope of the bottom, giving the same anchor pull angle of about 16 degrees (2). Of course, the boat needs a long line to the shore to keep the anchor under tension in the right direction. You can also see that as the boat moves back toward the shore the angle of pull on the anchor actually gets better as the angle gets smaller. Don't quote me on the precise angles or the correct amount of scope for this sort of situation, but you can see that you clearly don't need 4 x 14 meters (56 meters) of chain to anchor in this 14 meter depth like you would on a flat bottom with the same depth.